The molecular weight limit for effective drug delivery is approximately < 500 due to the presence of barrier function called “tight junction” in cell-cell contacts. Traditional drug screening were therefore performed using chemical library of small molecules. However, after a long term effort, it has been now more and more difficult to find effective drugs only from the limited number of small molecules. 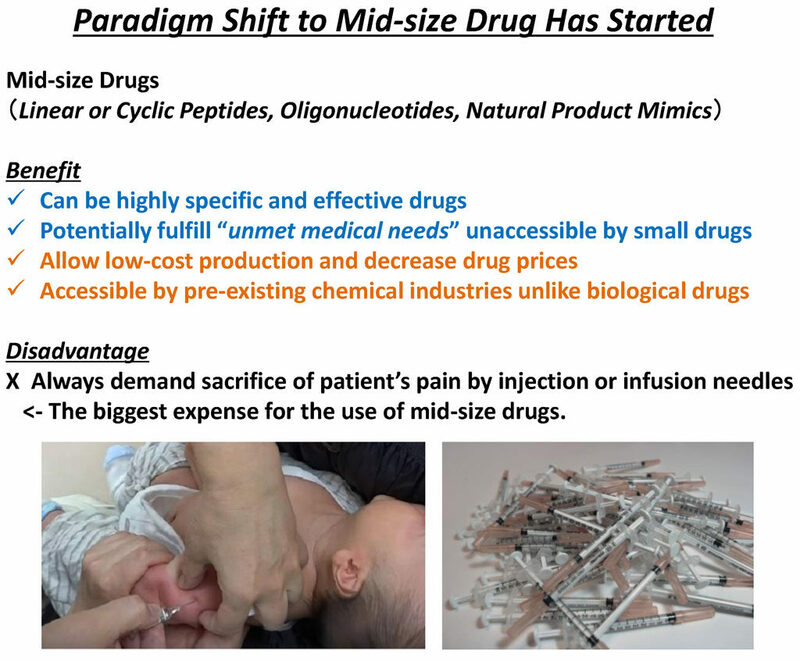 To overcome this situation, many pharmaceutical companies have recently succeeded to find drugs from the pools of middle sized molecules (MW 500-2000, e.g. 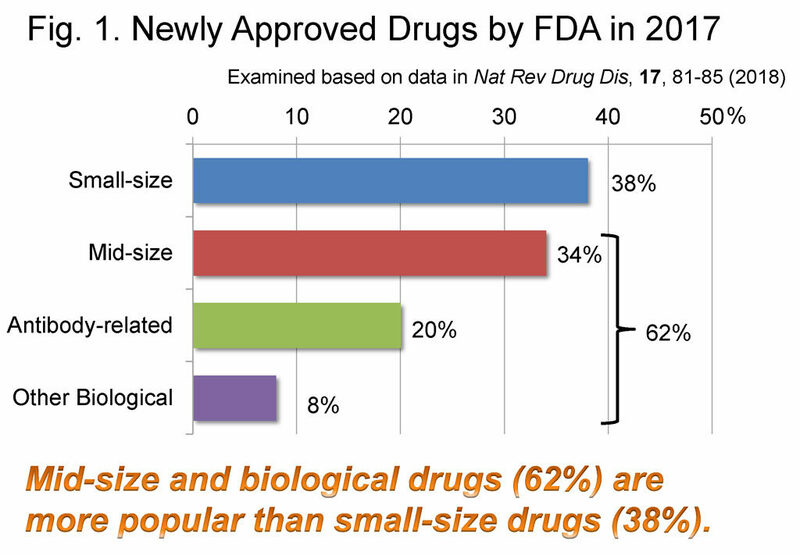 nucleic acids, polypeptides and natural materials) or proteins including therapeutic antibodies (MW > 5000), and now many newly approved drugs are either mid-size drugs or antibodies (Fig. 1). Currently, injection needle is the only one choice for us to deliver such larger drugs beyond the cell barrier. But if these larger drugs become more and more popular, the frequency of therapeutic injections should be increased. Frequent use of injection needle even by the skilled healthcare workers should be significantly painful for patients. Nevertheless, the risks to be suffered from side effects or inflammation will increase. Rising cost for injections will also give us massive financial impact. Thus, for better quality of life, new safer technology instead of injection needle is definitely needed. 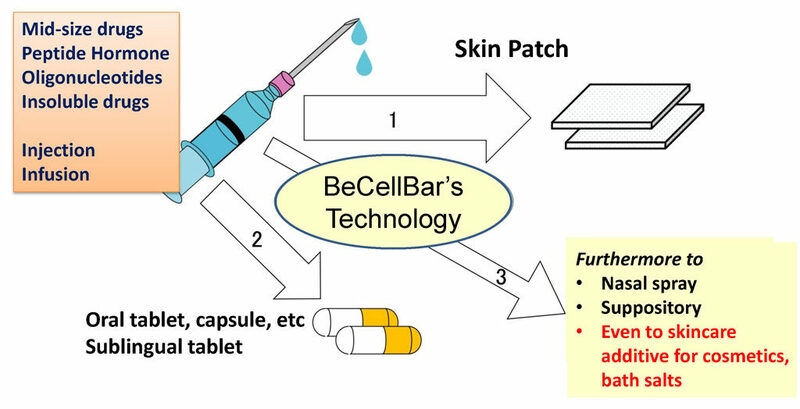 BeCellBar, LLC was established in 2017 to sort out the above problems on next generation pharmaceuticals. We possess various types of tight junction modulators that enable to “open or close” the tight junction cell barrier so that the absorption of mid-size or even larger drugs is enhanced beyond the cell barrier. Our technology will allow the safe, painless and low cost delivery of mid-size drugs and improve your quality of life. “Needleless makes everyone happy!” is the hope of BeCellBar.